I was lucky enough to have lived with Tommi (Anton) Parzinger furniture as a teenager. I was raised in a modern house, and my mother worked with an interior designer who ordered several Parzinger pieces, a brass-studded sideboard, a brass chandelier and a coffee set. Today my sister has the sideboard and I have the coffee set. When I and my husband moved into our first house in the early 1970s, I inherited the same designer and she ordered a Parzinger mahogany desk for our bedroom. I remember fondly the refined and elegant desk with its meticulous workmanship and elongated horizontal brass pulls (referencing early 18th century neoclassical bronze mounts) and always enjoyed working at it, even though it was a bit dainty for someone who worked with opened books on the surface. About eight years ago when I was interviewing Parzinger’s partner Donald Cameron, he told me that he had actually designed the desk. So when the opportunity arose to acquire for Cooper Hewitt part of the Tommi Parzinger archive, I and my museum colleagues jumped at the chance. 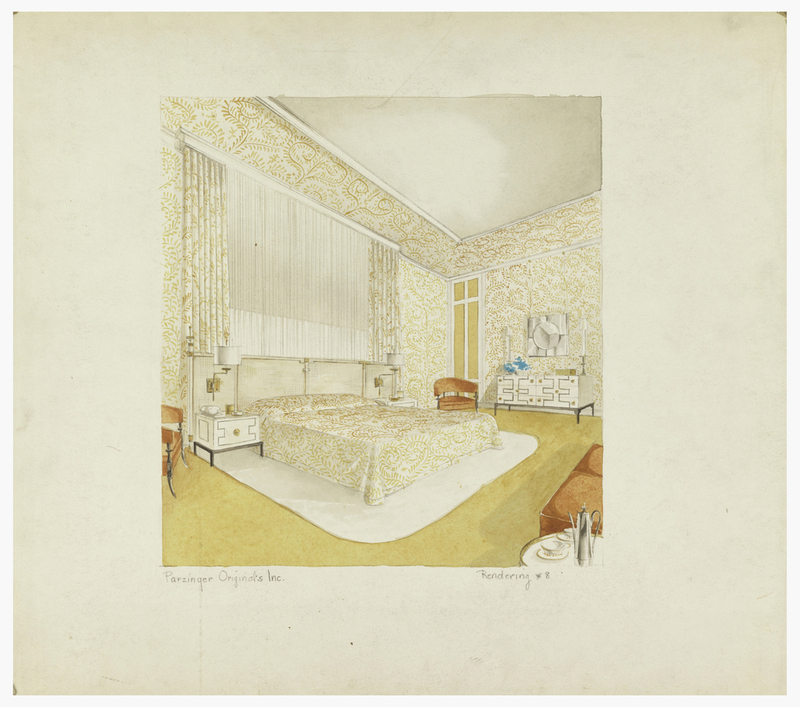 Among the works acquired were a number of interior design drawings. One of my favorites is this Design for a Bedroom Interior. While the client for this design has not yet been identified (it could well have been for one of the Ford’s, Rockefeller’s, Dupont’s, or Mellon’s who were among Parzinger’s clients), the drawing incorporates many of Parzinger’s characteristic design ideas which he would customize for his individual clients. The inscription in the lower right margin, “Rendering #8,” identifies this work as a one in a series of presentation drawings to be shown to the client for his or her approval before proceeding with fabricating the furniture, textiles, etc. This sumptuous bedroom in sunny yellow, orange and white displays a scrolled fern-pattern textile, likely a Parzinger design, on the bedspread, walls, and ceiling cove unifying and harmonizing all of the objects in the room. The Japan-style white lacquer cabinets with the artfully integrated Greek-key wood insets and decorative brass knobs are immediately identifiable as Parzinger creations. Above the matching end tables are a pair of Parzinger-designed hanging brass wall fixtures whose swinging arms can be rotated toward the bed for nighttime reading. Also visible on a round white table in the right foreground is a silver (probably) coffee pot whose tall and slender silhouette with wood handle spanning the length of the body is similar to coffee pots that Parzinger designed in silver around 1940 and in brass through the postwar period. The luxurious refinement of the total environment is underscored by the white pile rug beneath the bed.